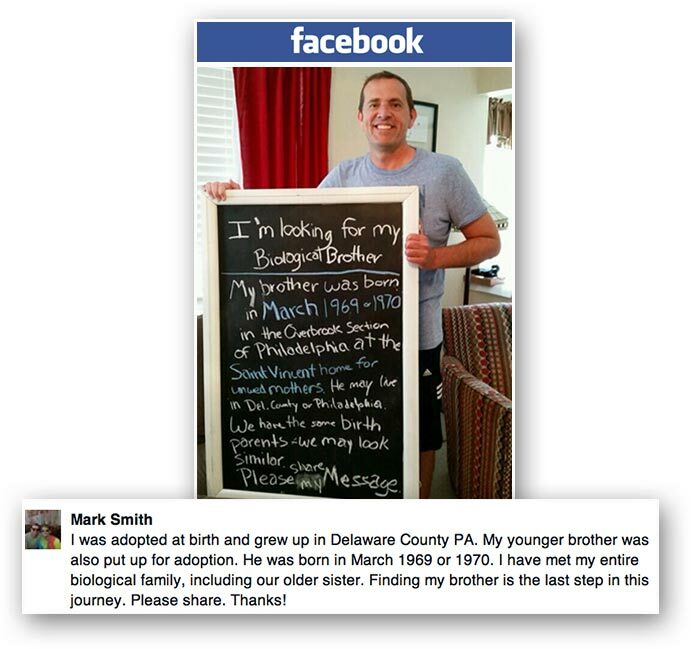 Mark Smith of Middletown, Delaware is using social media to find an important person in his life - his brother. MIDDLETOWN, DE -- Mark Smith of Middletown, Delaware is using social media to find an important person in his life - his brother. Smith, 48, is recovering from a broken ankle. While off work, he decided to use his time to search for a little brother he has never met. "He was born in West Philadelphia a part of St Vincent's Home for Unwed Mothers," Smith said. He posted what he knows on Facebook. The brother would now be 45, maybe 46. He was adopted through a Delaware County agency and he was a pretty big baby. "He was approximately 12 pounds at birth," Smith said. Smith was also adopted and raised by a loving family. But as a teenager, he began to think about his birth family. Over decades he reached out to his birth mother. He found a half-sister, and his paternal, uncles and cousins are now close. Though his birth father, now deceased, wanted nothing to do with him. "It was a negative that my birth father didn't want to meet me. But I gained so many other people in my family through him, so it ended up being a positive for me," Smith said. Smith hopes his current quest will be positive. It's a longshot, he concedes. It's possible his brother won't want to meet or not even know he was adopted. Cousin Gerriann Beatty hopes Smith finds his brother. "We would all welcome him as part our family as we did Mark. He's our family. We got to meet Mark, Mark's kids," Beatty said. Smith has four of his own children including now teenage twins who were with him Tuesday. He says one asked him why finding his brother was so important. "I said to them, 'Could you imagine if Mommy and I put our first child up for adoption? And you would be missing a part of our family.' I think for my own children it was an aha moment," Smith said.